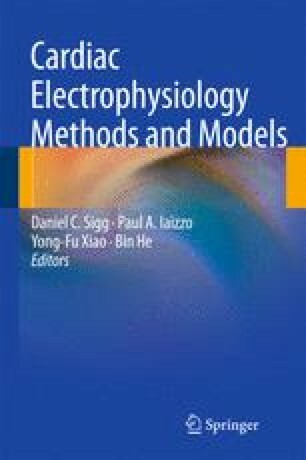 Mathematical models of cardiac cellular electrophysiology have evolved significantly over the last 50 years. Beginning with the initial four ODE models from Noble in 1962, models are now being developed with many tens of differential equations requiring hundreds of parameters and integrating multiple aspects of cellular physiology. Such increases in complexity inevitably result in significant barriers to the use of the models by independent scientists or even application of existing models in novel scenarios. Technologies are being developed which negate these barriers to some extent and provide tools to aid model developers and users in the reuse of previous models. In this chapter, we review some of the common cardiac cellular electrophysiology models and place them in the context of current model description technologies in order to illustrate the current state of the field. Nickerson DP, Hunter PJ. The Noble cardiac ventricular electrophysiology models in CellML. Prog Biophys Mol Biol 2006;90:346–59. URL: http://dx.doi.org/10.1016/j.pbiomolbio.2005.05.007. Rudy Y, Silva JR. Computational biology in the study of cardiac ion channels and cell electrophysiology. Q Rev Biophys 2006;39:57–116. URL: http://dx.doi.org/10.1017/S0033583506004227. Nickerson D, Buist M. Practical application of CellML 1.1: the integration of new mechanisms into a human ventricular myocyte model. Prog Biophys Mol Biol 2008;98:38–51. URL: http://dx.doi.org/10.1016/j.pbiomolbio.2008.05.006. Wimalaratne SM, Halstead MDB, Lloyd CM, et al. Facilitating modularity and reuse: guidelines for structuring cellml 1.1 models by isolating common biophysical concepts. Exp Physiol 2009;94:472–85. URL: http://dx.doi.org/10.1113/expphysiol.2008.045161. Nickerson D, Buist M. Interactive reference descriptions of cellular electrophysiology models. Conf Proc IEEE Eng Med Biol Soc 2008;2008:2427–30. URL: http://dx.doi.org/10.1109/IEMBS.2008.4649689. Nickerson DP, Buist ML. A physiome standards-based model publication paradigm. Philos Transact A Math Phys Eng Sci 2009;367:1823–44. URL: http://dx.doi.org/10.1098/rsta.2008.0296. Beard DA, Britten R, Cooling MT, et al. Cellml metadata standards, associated tools and repositories. Philos Transact A Math Phys Eng Sci 2009;67:1845–67. URL: http://dx.doi.org/10.1098/rsta.2008.0310. Garny A, Nickerson DP, Cooper J, et al. Cellml and associated tools and techniques. Philos Transact A Math Phys Eng Sci 2008;366:3017–43. URL: http://dx.doi.org/10.1098/rsta.2008.0094. Cooling MT, Hunter P, Crampin EJ. Modelling biological modularity with cellml. IET Syst Biol 2008;2:73–9. URL: http://dx.doi.org/10.1049/iet-syb:20070020. Cortassa S, O’Rourke B, Winslow RL, Aon MA. Control and regulation of mitochondrial energetics in an integrated model of cardiomyocyte function. Biophys J 2009;96:2466–78. URL: http://dx.doi.org/10.1016/j.bpj.2008.12.3893.